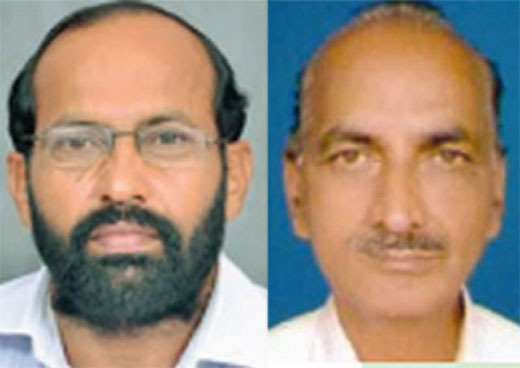 Mangalore/Udupi, Aug 22, 2014: Reports have come in that 2 teachers Ramesh Nayak and Lakshmikanth Bhat-from Dakshina Kannada and Udupi district have won National -level Best Teacher Award. The award will be presented at Rashtrapathi Bhavan in New Delhi on September 5. Speaking to mediapersons, Ramesh Nayak, Headmaster of Dakshina Kannada Zilla Panchayat Higher Primary School at Keddalike in Bantwal taluk said “Iam happy to have won the award. My school shares the national recognition through this award. The award has also given a recognition to the school, taluk and the district.” Nayak had started his teaching career in 1980 at Permayi in Kadaba. Later, he served at Rayi school for 21 years. He has also served at the CRP for three years. He has been serving at Keddalike school for the last five years. In the last five years, the school had won best school award at the district-level, best SDMC award and award for cleanliness. The school has also been selected as the best school for Akshara Dasoha. Nayak with the support of other teachers in the school has developed a kitchen garden which supplies needed vegetables to the mid-day meals. This year, ridge gourd, cucumber, brinjal, spinach, okra, ivy gourd, papaya (Tiwan variety), drum sticks and long yard beans have been grown in the school. The children in the school have been encouraged to grow fruit bearing saplings. Various Students’ associations started under his guidance have been adding to the robust learning process in the school. From Udupi dist; Lakshmikanth Bhat, from Government Modern Higher Primary School, Nanadalike in Karkala is happy over the recognition. He is delightful that he could bring laurels to school where he has been working for the last 20 years. He said the award is the most prestigious one that he is recognised with, all through his teaching career. He has spent all his professional life in rural areas. He said he struggled hard to introduce English language right from the class 1 in Nandalike government school. The decision to introduce English was taken to face the challenges posed by the English medium schools in and around Nandalike. English language was taught in the school since 1999. “I also raised funds from the donors to improve infrastructure facilities in the school. The school has been giving importance to quality education. EDUSAT has been introduced in the school. He had started his career at Gonala in Bijapur in 1981. Later, he has served at Koranje school in Karkala. In the last 20 years, he has worked for the integrated development of the school. The school has won district-level best school award, Best SDMC award and Best Meena team award. Because of his efforts, his school has been getting first prize and best school award in the annual evaluation conducted by the education department for the last five years.